Recorded in various spellings including Hayford, Heaford, Hefford, and Heafford, this comparatively rare surname is English and locational. It is believed to originate from a now 'lost' village thought to have been situated in the county of Devonshire. During the 15th Century many villages were forcibly 'cleared', and their inhabitants forcedonto the roads, to make way for sheep pastures. In addition natural disasters such as the plague known as 'The Black Death' of 1348, also led to the disappearance of villages and hamlets from the maps. Today the only memory of these places is to be found in the surviving surnames, often in widely varying spellings. In addition locational surnames are usually 'from' names, and therefore often not recorded in their original regions. These names were given to people as easy identification, after they left their original homes and moved elsewhere. This was often the city of London, the only large place in the country, and also the only place that most country people would have even heard of. In this case we have a number of early examples of the recordings from surviving registers of the Diocese of Greater London. These include: Thomas Hafforde, at St Giles Cripplegate on February 2nd 1594, Thomas Hayford, who married Mary Deybanck at St Mary, The Virgin, on August 12th 1616, and Thomas Heaford who married Susanna Lewis at St Michael Bassishaw on December 17th 1634, all in the city of London. 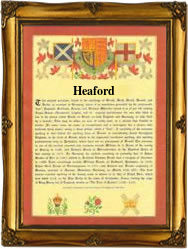 The first recorded spelling of the family name in the West Country may be that of Elizabeth Heaford, daughter of John and Martha Heaford. This was dated August 15th 1739. Throughout the centuries, surnames in every country have continued to "develop", often leading to astonishing variants of the original spelling.